Oil on Baltic birch, 28" x 23"
My former teacher, Robert Keyser, introduced me to Feldman's music when I was an art student in 1971 with an old copy of a record. I've been interested in his music ever since then. Feldman's article, "After Modernism", written for Art in America in December 1971, had a big influence on me as an art student at that time. Even though some of the ideas may seem dated today, the basic thesis of the article still rings true in keeping faith with the painting process as opposed to modernist theory. Feldman was interested in making music more monolithic as in Rothko's paintings. My own work, in a way, does the opposite by splitting abstract painting into various narrative "movements" or interconnecting panels. Over the past ten years, my paintings have gone from a more austere geometrical format to shaped works that include biomorphic forms. 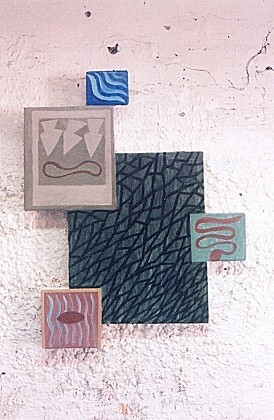 The paintings are divided into several sections where organic shapes become like characters in the scenes of a story. As a result, the pronounced physicality of these paintings exists in contrast to the more ethereal presence of narrative. The air or wall space surrounding each work takes on a more active role when placed next to the images placed in each section. My colors have become more muted and transparent while retaining their glowing light. With these paintings, the didactic statements of 20th century abstraction have been gently subverted through a hint of storyline and a dash of humor. It is this more open alternative for abstract painting that I wish to convey to the viewer. I think it was this gentle subversion of modernism that Feldman was also after - Marc Salz.